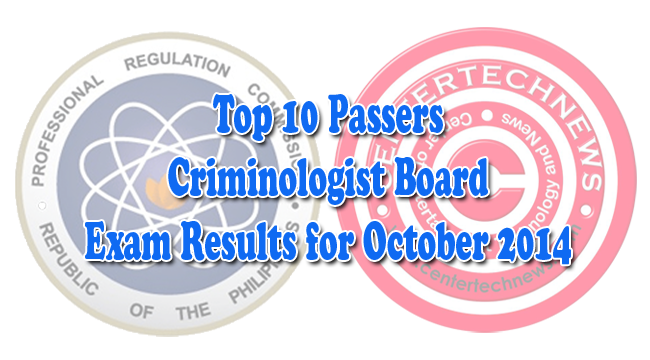 Together with the list of Criminologist Board Exam, PRC had also released on November 26, 2014, the list of top examinees who are able to reach the 10 highest ratings on the exam. The examination was given last October 19 - 21, 2014 and it took 26 working days before the official result of passers had been released on PRC website. The passer who secured the top spot is Christian Corpuz from Pagadian Capitol College, Inc.- Pagadian College of Criminology with the rating of 90.15 percent followed closely by Artemio Burce I of Manuel L. Quezon University with the passing rate of 90.10. The list of the top passers is always look forward to every year as it also brings pride to the school and the passer alike. Passers of October 2014 Criminologist Licensure Examination who wished to process their registration for the issuance of their PRC ID and board certificate must bring a duly accomplished Oath Form, 1 piece passport size picture (colored with white background and complete nametag, a current Community Tax Certificate also known as cedula that must be acquired from the right government employee, 1 short brown envelope with name and profession, 2 sets of metered documentary stamps and Initial Registration Fee of P600 and Annual Registration Fee of P450 for 2014-2017. The registration will be on December 2 to 5 only.